Born in Lithuania, Lipchitz settled in Paris in 1909, where he became friends with Gris, Archipenko, and Modigliani, and lived next door to Brancusi. His meeting with Picasso in 1913 influenced the course of his artistic development. Lipchitz responded to the sculptural potential inherent in Cubist theory, and became the foremost Cubist sculptor of the era. Shortly before he began work on The Figure, Lipchitz experimented with small works he called "transparents." He described himself as "playing with space, with a kind of open, lyrical construction that was a revelation to me." His most famous work, The Figure, was partly inspired by the tribal art that he collected. Indeed, the bronze has a powerful presence not unlike that of totemic figures. In 1941 Lipchitz moved to the United States, where he spent the rest of his life. Jacques Lipchitz explored the possibilities of Cubism in three-dimensional space more thoroughly than any of his contemporaries. He first met Pablo Picasso in 1913, an encounter that influenced his sculpture for the rest of his long career. During the summer of 1926, Lipchitz went to Brittany to visit the famous architect and friend Le Corbusier. 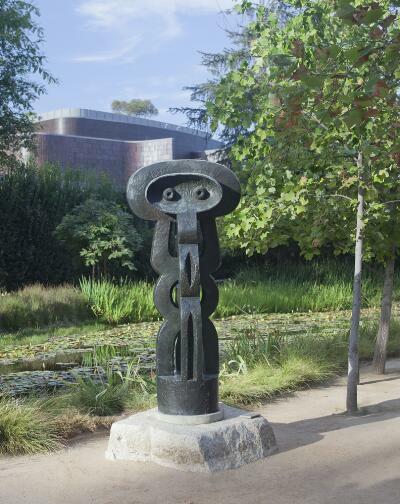 During his stay, Lipchitz started to make models for this free-standing figure, which he aptly dubbed a “Totem.” The title came to him only after seeing the sculpture enlarged and cast in bronze. As you can see, its bold iconic features and abstract, interlocking forms exude an air of pagan mysticism. To hear more about how many of Lipchitz’s sculptures were lost or destroyed, press 3531.